Everything you need, right out of the box. Superior accuracy, top-of-the-line performance, at a price that's tough to beat. 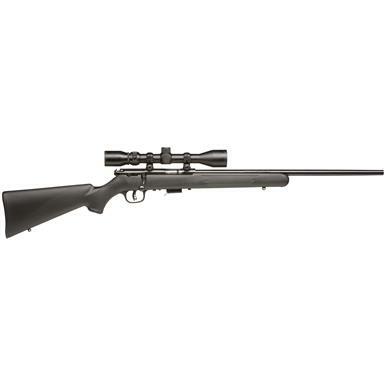 Whether you're into spending Saturdays honing your aim at the range, or you're looking to do a little "pest control" around your place, this Savage Rifle is built to perform. Plus, it comes with a 3-9x40mm Scope, mounted and boresighted to get you going right out of the box. This Rifle also has Savage's famous AccuTriggerTM. The AccuTrigger is unique only to Savage rifles…many have tried to imitate the design, but Savage has it perfected. AccuTrigger offers a crisp, light pull that still protects against accidental discharge if dropped. Since its beginnings in 1894, Savage has been making top-quality, innovative firearms, and you can see this commitment to quality each time you shoulder your Rifle. Get yourself a Savage Rifle and experience the difference. Savage 93R17 FXP, Bolt Action, .17 HMR, Rimfire, 21 Barrel, 3-9x40mm Scope, 5+1 Rounds is rated 4.7 out of 5 by 6. Rated 4 out of 5 by TxPh from Nice rifle...bad scope This is my first .17....been wanting one for a while and I have a couple other savage rifles so I knew it was a good buy. HOWEVER...the scope is trash..unfortunately it was a package so I can't return or exchange it but the scope was junk. There is no adjustable eye relief on this or focusing adjustment so if you zoom it up for sighting in and start zooming out, the focus is WAY out and it messes it all up. I had to buy a scope where I was at to be able to make sure it was even sighted in correctly...which stinks because I was hoping for at least a good decent scope on here....change to something else Savage for the packages please. Overall, I would recommend the package but tell them to change the scope if its as bad as mine.. Rated 5 out of 5 by TerraH from Fantastic Deal My husband loves this gun! It's light weight and dead on accurate! Rated 5 out of 5 by COL W from Service with a BIG S! I'm happy that I've found this company. Best products ever and speed and service are the highest quality!!!!! !Will be using and spending many dollars and hours on their site.